Construction began in 1911 by the ACR and was completed in 1912 by the CPR. Last train across the bridge was in 1981. 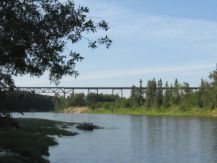 The Forth Junction Heritage Society is advocating that the Mintlaw steel railway bridge, located in Red Deer County, be preserved, designated a historic resource with safe access restored as a pedestrian and bicycle pathway and eventually within walking distance of a major rail and transit interpretive centre. The Society also intends to create a scale model of the bridge. 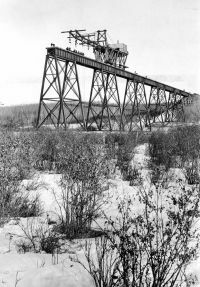 The background of the trestle begins at the start of the twentieth century when a group of Red Deer and Ontario investors and entrepreneurs had a vision of an east-west railway running from Red Deer west to Vancouver through the Yellowhead Pass and east to Moose Jaw and Fort Churchill with Red Deer as its headquarters. In May 1901, the Alberta Central Railway was incorporated by an Act of Parliament. The initial charter of the fledgling railway was for a 75-mile line running 25 miles east of Red Deer to the coal banks of the Red Deer River (near Nevis/Content Bridge/Tail Creek) and 50 miles west across the Red Deer River to Rocky Mountain House with the expectation that it would ultimately extend to the coal fields near Nordegg and northwest to Yellowhead Pass. However there were several delays before construction actually began and many started to wonder if the railway would actually get built. Construction did begin west of Red Deer in 1910 upon an official visit by Sir Wilfrid Laurier, Prime Minister of Canada, who drove the 'first spike' east of the bridge pier along Taylor Drive where the ACR crossed the Canadian Pacific Railway. In 1911, the railway started construction of a grand steel trestle across the Red Deer River southwest of Red Deer, just east of Mintlaw siding that later developed into a very small community which is long gone, but with a station and grain elevator. The bridge, the second longest CPR bridge of its kind in Alberta at 2,112 ft. long and 110 ft. high, was completed in the fall of 1912. (The longest of its kind was built in Lethbridge.) 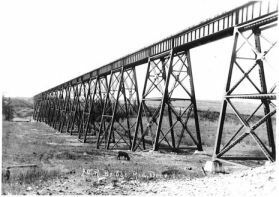 It was primarily built as a steel trestle but has truss and girder components with wood trestle piers at each end. The structure includes fifteen 75 ft. spans, fifteen 45 ft. spans and two 150 ft. truss spans across the river itself. It became a major landmark for people travelling along the river, the Calgary and Edmonton Trail and later for aircraft. Unfortunately, in its quest to build a high quality rail line, the Alberta Central Railway went bankrupt and the line was leased for 999 years to the Canadian Pacific Railway. Ultimately the ACR was dissolved and its assets transferred to the CPR. The CPR finished construction west to Sylvan Lake and Benalto in 1912 and to Rocky Mountain House by 1914. During construction, much of Cygnet (Burnt) Lake, west of the trestle, was drained by deepening the outlet south of Sylvan Lake. Regular passenger service to Sylvan Lake is believed to have started in 1913 although the line wasn't officially open until 1914. The Alberta Central Railway (later becoming the Alberta Central subdivision of the CPR) connected with the Calgary & Edmonton Railway (CPR) at Forth junction, south of present day 32 St. along Taylor Drive near Molly Bannister Drive. In 1962, the connection was relocated further south to Tuttle siding, at the time fairly isolated, to accommodate the construction of the Highway 2 expressway. Highway 2A didn't parallel the CPR line until 1985. The last train to go over the bridge was in 1981. Rails were removed a few years later after the line was officially abandoned as were each end of the bridge to discourage people from walking across the potentially dangerous structure. For 30 years, no maintenance was done on the bridge and there was a probability that the structure would eventually be torn down. 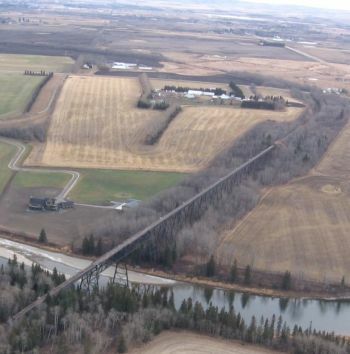 However, in December of 2009, Red Deer County agreed to purchase the trestle from CPR for $1 as an important heritage landmark and as part of a possible future regional pedestrian and bicycle trail. In late 2010, Red Deer County authorized $350,000 for some emergency repair work on the west end of the bridge where the wooden piers had deteriorated to the point of threatening the integrity of the entire structure. That work was undertaken in March 2011. Further work was done on the east side in 2014. In September 2013, Red Deer County received a Red Deer Heritage Award for its efforts to preserve the Mintlaw bridge. The county was nominated by the Forth Junction Heritage Society. Although there is currently no direct public access to the bridge, the structure can be viewed from Mackenzie Road (Twp. Rd. 374) west of the Calgary and Edmonton Trail southwest of the city from 32 Street. one of the top 10 longest railway bridges in Western Canada. As well as being a historic landmark in Red Deer County for a century, the bridge is also symbolic of the optimism and entrepreneurship of Central Albertans as one of the last, and certainly the largest, remaining relics of the Red Deer-based Alberta Central Railway and its dream of becoming a major western railway stretching from Churchill to Vancouver. Although the railway never realized its dream, it did open up for settlement the area west of Red Deer to the Rockies, provided much-appreciated passenger and freight service and was the catalyst that initiated a major boom that led to the establishment of Red Deer as a city and regional distribution centre. The bridge is among the top 3 longest steel railway trestle-style viaducts currently standing in Western Canada.